Home » Poultry Breeding & Genetics » Albino or Leucistic? Most of us have a mental image of an albino; a bird or animal that is completely white. To complete the picture accurately we should also see the red eyes. In birds, albinism is a complete lack of pigment in all feathers and soft parts. Their feathers are white, and bill, legs and eyes are pink. True albinos are normally less robust in other ways and sometimes may have deficient eyesight or hearing. There is also evidence that wild albino or leucistic birds might, on occasion, not be recognised or accepted by a potential mate, so as it is a recessive characteristic and only shows up when a bird inherits the albino gene from both parents, they don’t occur very often. When they do, survival is not assured. 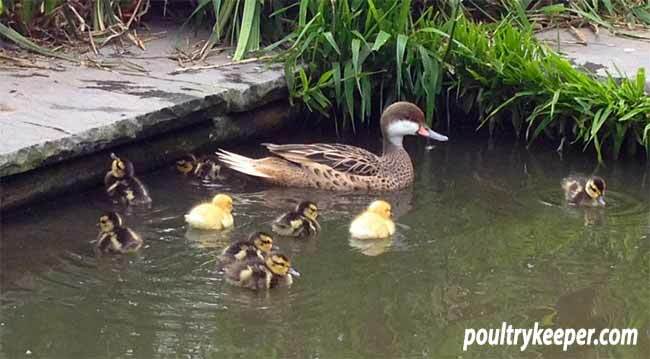 Albino and normal coloured Smew ducklings at 22 days old. Although both hatched on the same day, the albino has not thrived like its sibling and now is almost blind. Over 160 species of British birds have been recorded showing ‘partial’ or complete albinism. 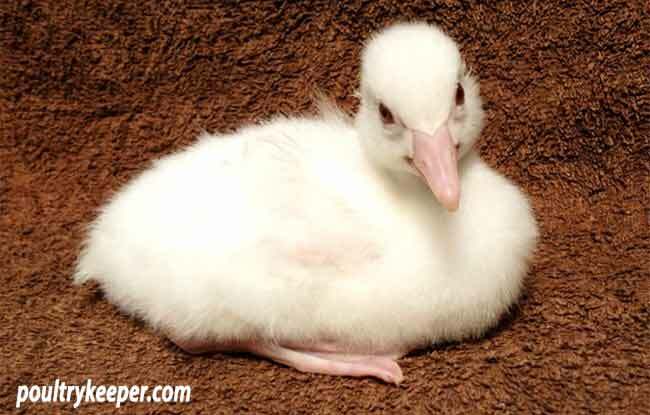 Only a minute proportion of wild birds are true albinos. The striking colour variation that we see in our beautiful waterfowl arises from selective breeding of different individuals that have cropped up naturally. These colour mutations are often known as ‘leucism’, where the melanin element of colour is reduced or missing. Sometimes the feather patterning is still obvious. Again, the characteristic is inherited. You might have two visibly normal parents and a leucistic duckling pops up from time to time in a brood. In colour mutation circles, these parent birds would be known as ‘splits’. The colours in feathers come from three pigments: Melanins, carotenoids, and porphyrines. In particular the melanins, responsible mainly for blacks, impart a resistance to abrasion. Many birds that are basically white have black tips to their wings, the primary feathers suffering the most wear. Where too much melanin is present the bird may appear completely black – this would be a ‘melanistic’ bird. Protected from predators and given plentiful food, aberrant birds do well in the closed environment of our pens and gardens. There has been some discussion about the proper terminology for these conditions (Buckley 1982, Davis 2007, van Grouw 2006), with competing proposals from aviculturists, ornithologists, and birders. One of the reasons for this disarray is the lack of a simple ‘umbrella’ term for all conditions involving the reduction of melanin, so you need to be careful calling something a partial albino. 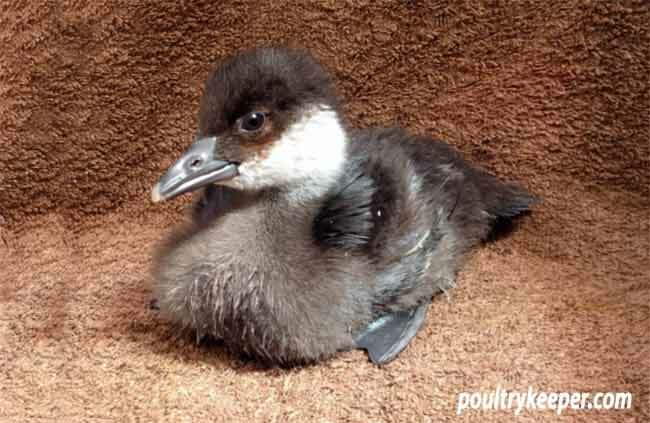 They can be referred to in terms of their mode of inheritance and interaction with other plumage patterns. The problem is that there are so many different kinds of white plumage in birds. For example, in chickens there is dominant white in the White Leghorn, recessive white in White Wyandottes and ‘silver’ in the Light Sussex. In chickens and possibly in ducks, complementary forms of recessive white have been found, such that when type 1 is mated with type 2, the progeny are coloured. In domestic ducks, the homozygous form of blue dilution, found in the Blue Swedish and Blue Orpington is almost pure white in the female. In addition there are a host of different kinds of white spotting or markings as seen in the Fawn and White Runner and Magpie ducks. Fully grown, Bianca the Albino Smew lacking pigment in feathers and showing red eyes. Some leucistic birds, often described as ‘silver’, lose all the pigment in their feathers and may appear pure white. Whatever term you use for aberrant plumages, the key difference between these and albinos is the lack of pigment in other parts of the body. This article was written with the kind assistance of F.M. Lancaster. 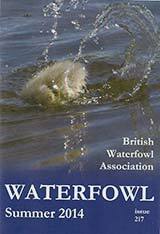 This article has been reproduced with the kind permission of the British Waterfowl Association. It originally appeared in the Summer 2014 edition of Waterfowl Magazine which is a 60+ page magazine, published three times a year for members. 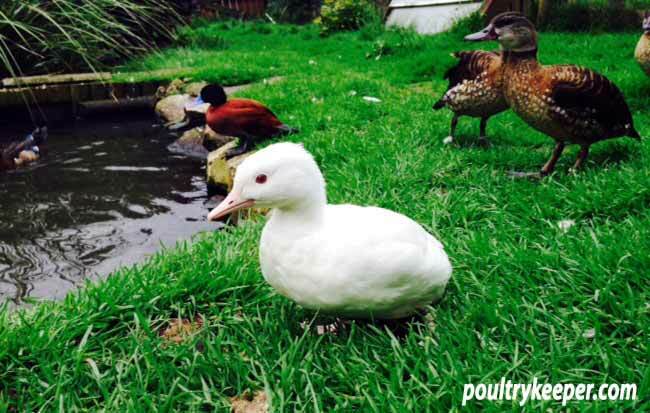 Morag keeps a few chickens & domestic ducks as pets but her main passion is for wildfowl. At her Aberdeenshire home she has kept more than forty species of whistling, perching, dabbling, diving & sea ducks & geese.